Jill Lajdziak will head sales and marketing at Smart USA. Editor's note: An earlier version of this story misstated when GM announced Jill Lajdziak's retirement from Saturn. Smart USA has hired Jill Lajdziak, Saturn's former top executive, to lead sales and marketing and stem a 38 percent decline in U.S. sales this year. Lajdziak's responsibilities as vice president of sales and marketing will include “enhancing awareness of the Smart brand,” the unit of Penske Automotive Group Inc. said in a release today. She assumes her post Jan. 1. 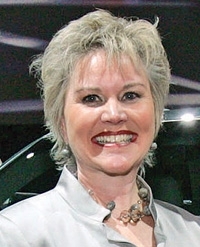 In October, General Motors Co. announced Lajdziak, 52, would retire as Saturn's general manager at the end of the year. Penske planned to acquire Saturn from GM, selling a new line of Saturn-badged vehicles made by Renault. But the deal collapsed at the last minute on Sept. 30 when the Renault SA board unexpectedly rejected the arrangement. Lajdziak will lead the Smart sales organization as well as advertising, marketing and sales. The job was previously held by Russ Hill, who has left the company “for personal reasons,” according to a Smart spokesman. The additional responsibilities of marketing were added to the job, the spokesman said. The Smart ForTwo microcar went on sale in January 2008 and initially exceeded expectations. But sales have floundered this year, falling 66 percent in November compared with a year earlier and 38 percent for the 11-month period. Smart USAhandles U.S. distribution of the Smart, made by Germany's Daimler AG. Smart has 79 dealerships in the United States.